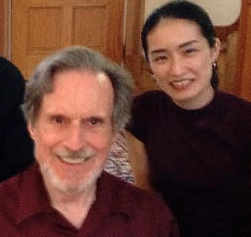 Violinist Mitsuko Suzuki partners with BKO’s pianist/artistic director Uel Wade. The evening taps Suzuki’s virtuosity in pieces like Tchaikovsky’s Scherzo-Valse, Wieniawski’s Capriccio-Valse, and Miletic’s Danse for Solo Violin. There will also be the humor of Shostakovich’s Polka, the perfume of Ravel’s Habanera, the grit of Piazzolla’s Tanguano, and the quirkiness and melancholy of a Chopin Mazurka, not to mention Ragtime, polka, barn dance, Spanish dance, and African Dance. Because this music dances, much of it is fast. Among the fastest is Fiddle-de-Bop, composed by pianist/arranger/composer, Lincoln Mayorga.